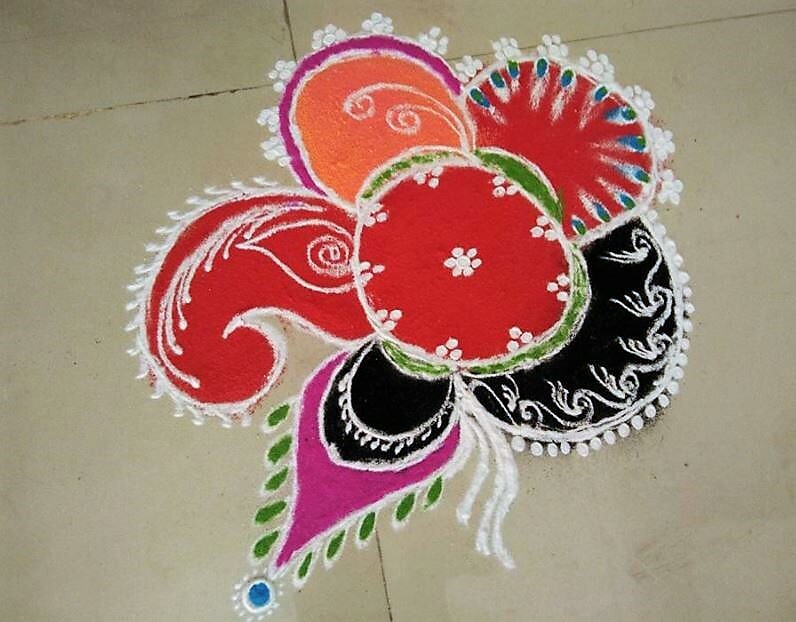 Get the best rangoli design for Diwali. Make them to decorate your home for the festival. Use bright-colored rangoli powder to match the festive spirit. People make rangoli designs at the entrance of their home during Diwali to welcome goddess Lakshmi and seek her blessings for a prosperous life. They decorate it with diya in the evening. Rangoli is an ancient art of making beautiful designs and patterns on the floor using rangoli powder. These rangoli patterns can be simple or complex in nature depending on the ability of the artist. Nowadays rangoli making has caught up with the masses. People make all kinds of rangoli design. 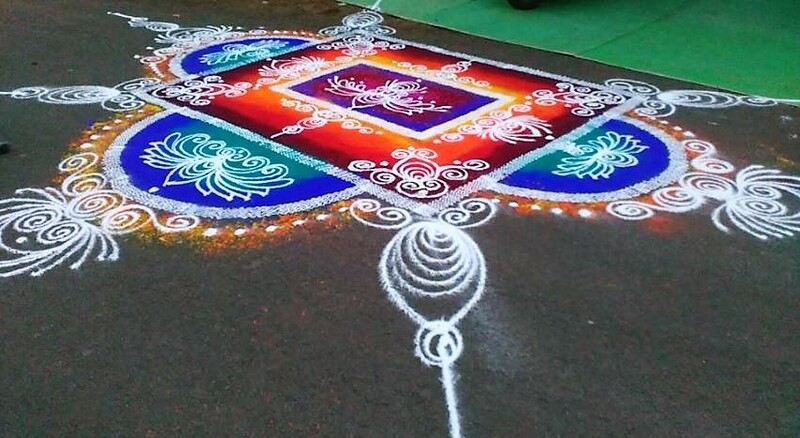 They experiment with the shape, size, and patterns to make unconventional rangoli designs. Rangoli stickers, sieves and stencils are also available in the market for the convenience of people who don’t have the flair for it. 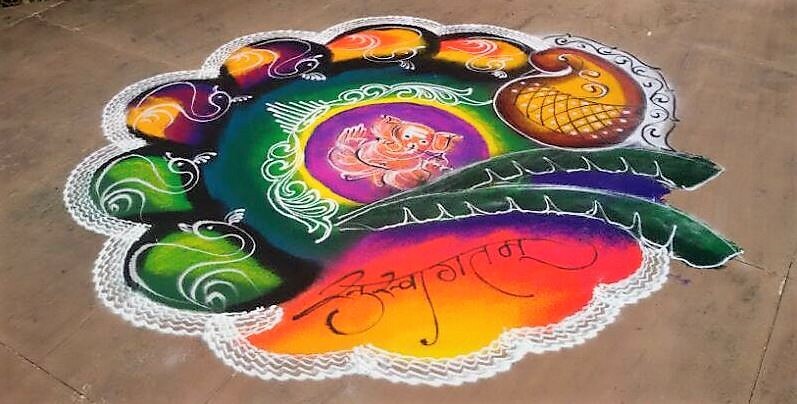 Many professional rangoli artists conduct classes and workshop to teach this art form. I bet no one can pass through this without taking a glance at this rangoli. I love the red, green, orange and blue color used in here. 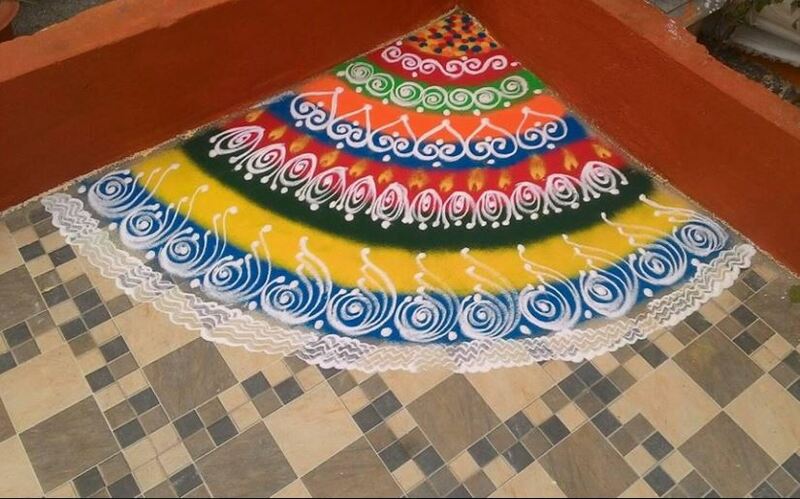 If you are a beginner, then go for this small easy rangoli design. 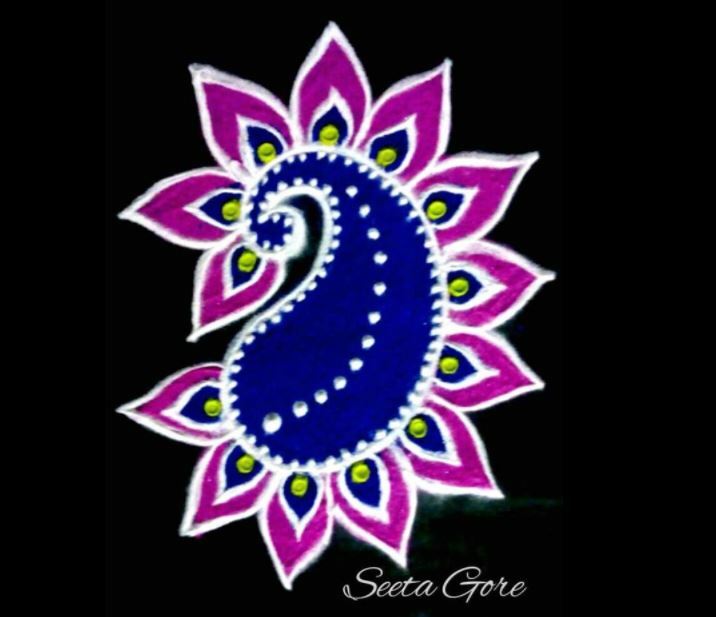 Make a paisley design and fill it with blue color and make pink petal patterns around it. Decorate your portico, courtyard or corridor in this similar fashion. 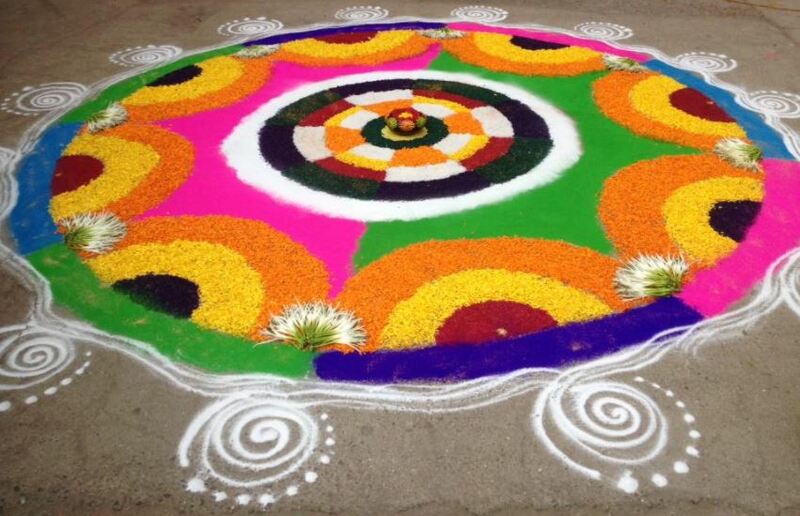 Make a border using flower petals and a traditional round rangoli ‎in there. Create a vibrant base by using shades of red in the center and green on either end. Now use white rangoli powder to make Sanskar Bharti patterns on it. The white tiled floor makes the colors pop out. This is another one from the elegant peacock rangoli collection and it’s really awe-inspiring. Use flower petals to make this simple but chic rangoli design. 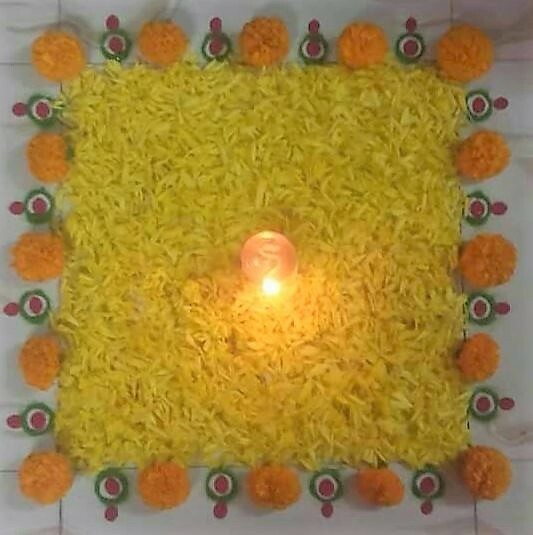 Make a square rangoli using yellow marigold petals. Surround it with orange marigold flowers and an easy rangoli pattern. Diwali and rangoli making go hand in hand. Pick up this lovely rangoli for your home. 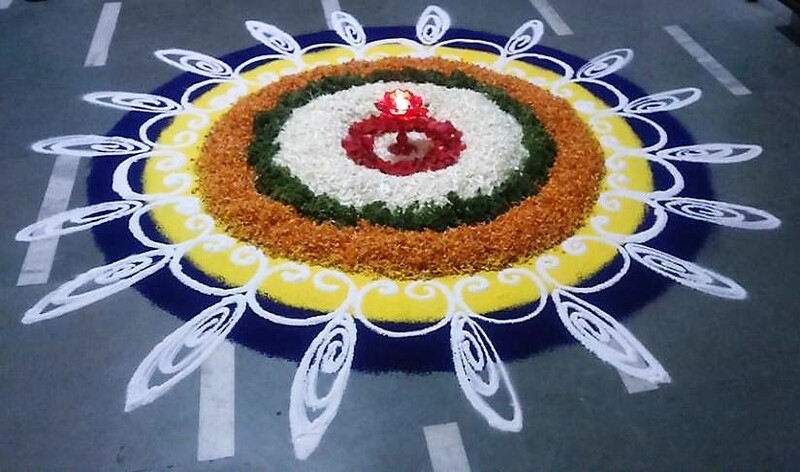 Or, you can try this rangoli with concentric circles and semi-circles. 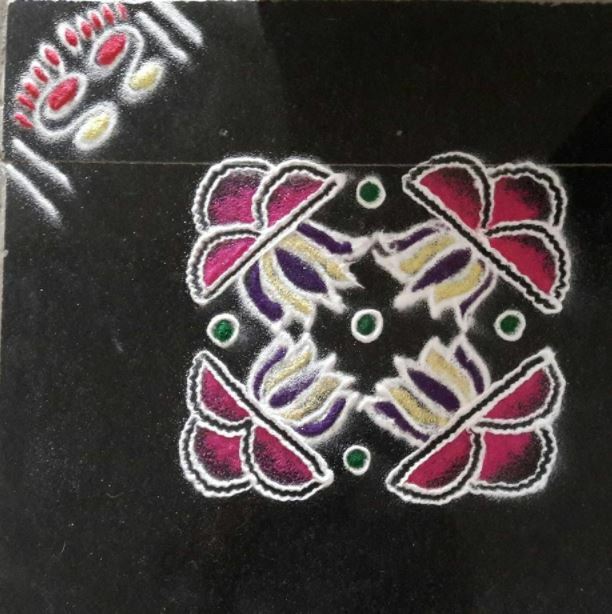 Welcome the deity with this small rangoli design. This rangoli is perfect for your pooja room. Make this rangoli for competitions. I love the base of this rangoli design. Sprinkle rangoli powder to get this cool 3D like effect. 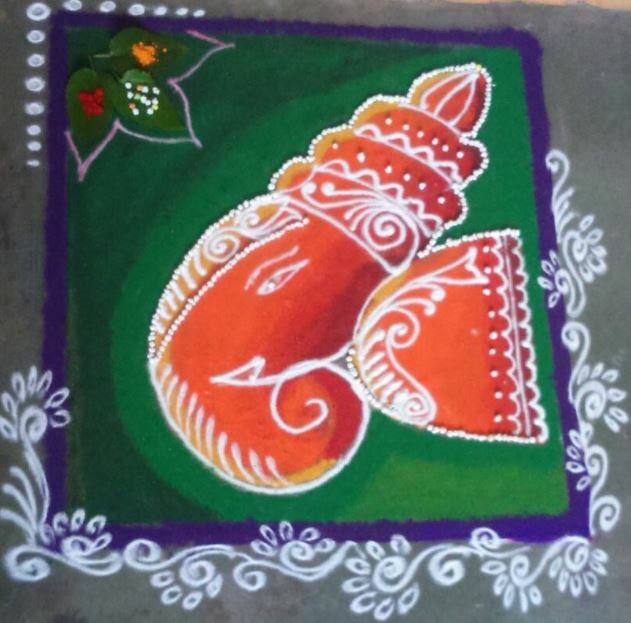 Draw this rangoli with Ganesha in the center. Make peacock on the outer circle and finish it off with a nice border. 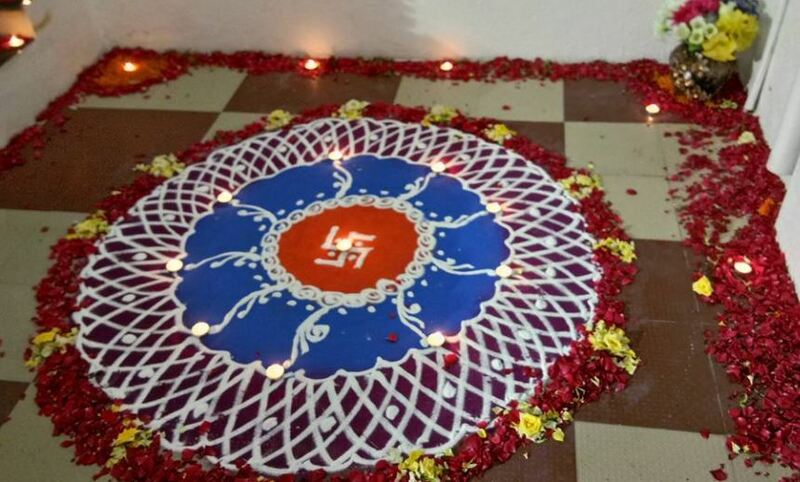 Placing diyas can transform your rangoli into something that is beyond words. Match the real diya with one in the rangoli design. 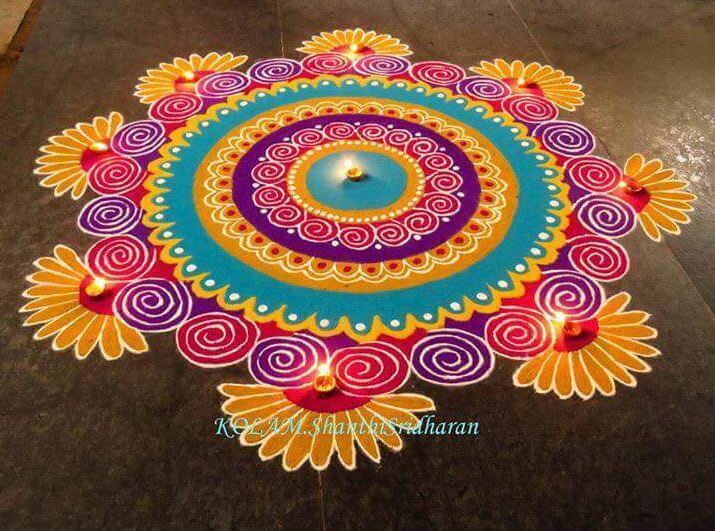 Choose this rangoli design for Diwali for your home. I like the intricate feather like pattern made using white rangoli powder. 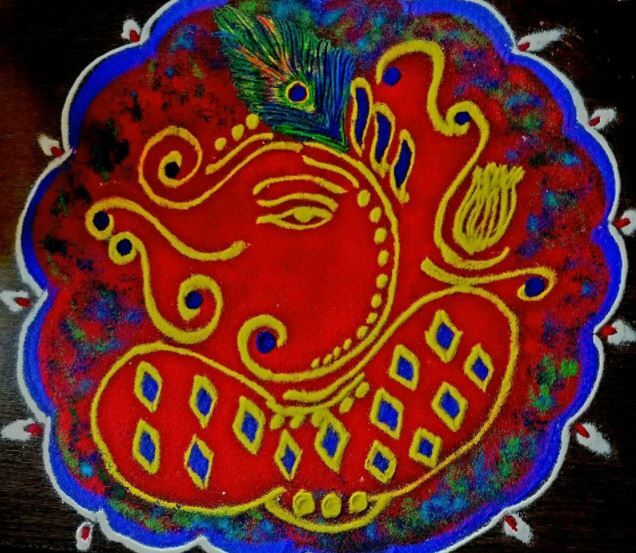 Here is an easy Ganpati rangoli design to get you up and started for the festive season. Choose a corner of your choice to make this rangoli. Use different colors in the background and make simple patterns on it. No Hindu pooja or festival can start without offering prayer to lord Ganesha. 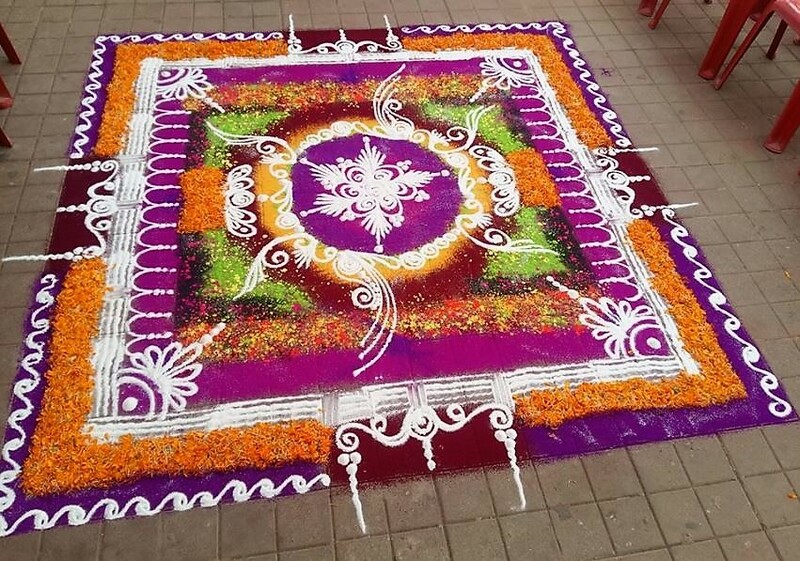 Take a look at this impeccable rangoli with a stunning white border. Check out this rangoli with a message in Hindi. 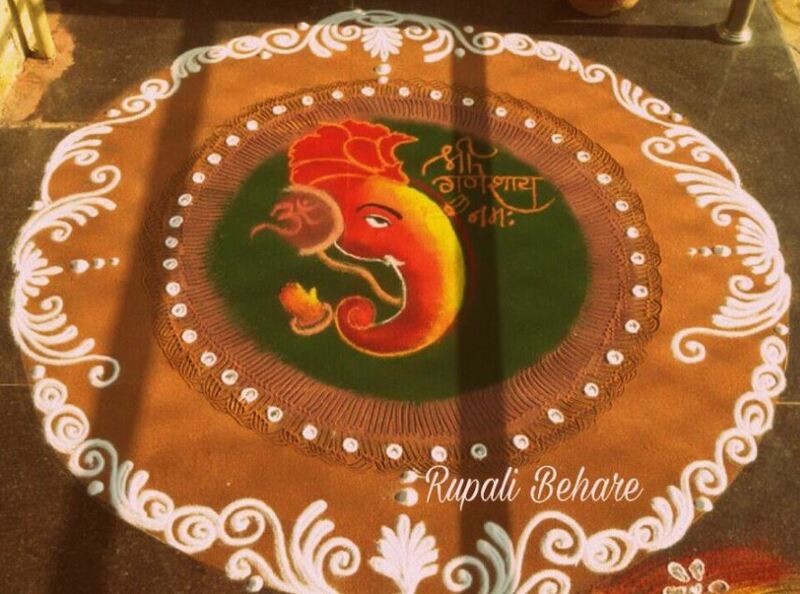 It looks more like a poster rather than a rangoli. This Diwali spread the message across with this rangoli and have fun with your family and friends. Here is the most inspiring piece of rangoli work I have seen. 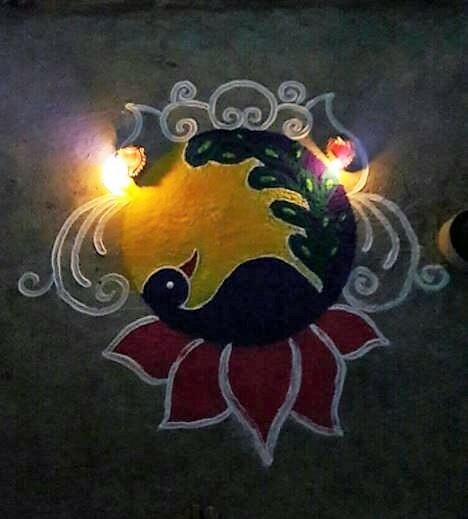 Draw this kolam rangoli in your courtyard and decorate it with diyas at dusk. 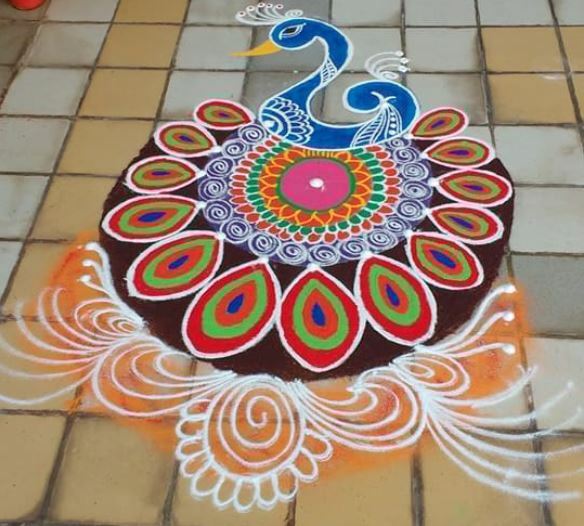 Get ideas on how to make a peacock rangoli. 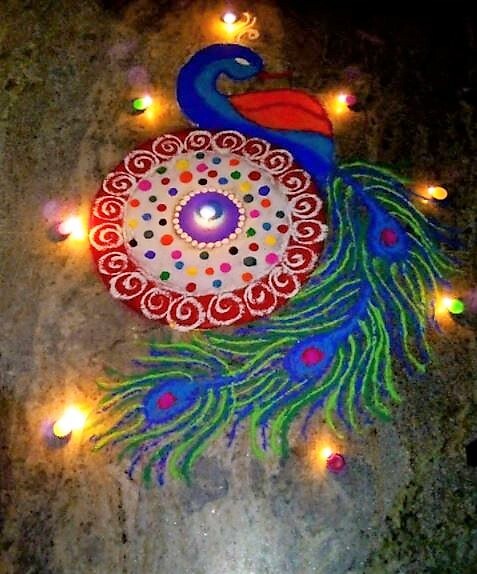 This gorgeous rangoli is for you guys, get inspired. You just can’t get enough of peacock rangoli designs. 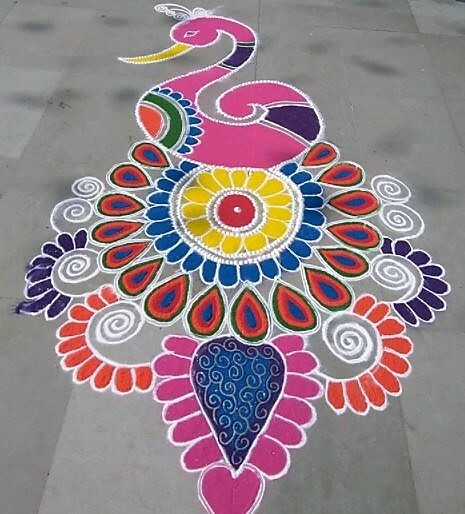 Go for this small rangoli where the peacock is perched on pink color lotus petals. 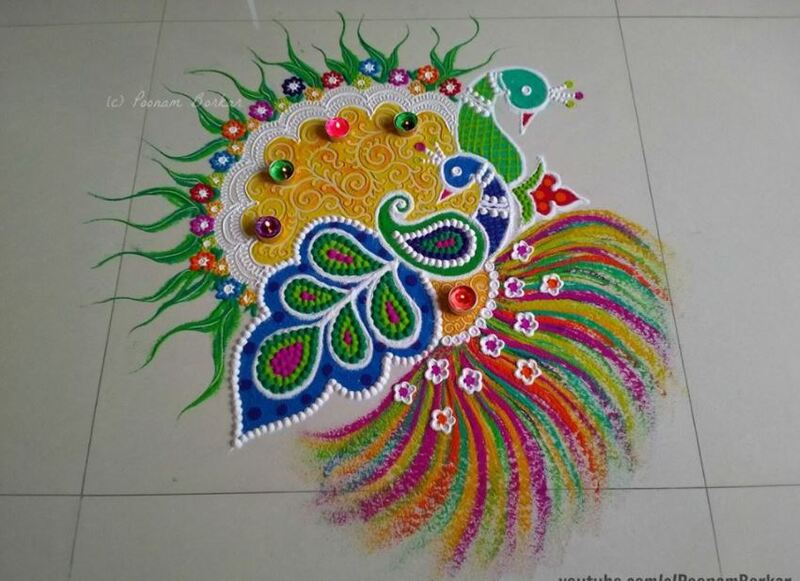 Check out this amazing peacock rangoli design. Draw floral designs below it to compensate for its feathers. Make it stand out by drawing bold white outline. 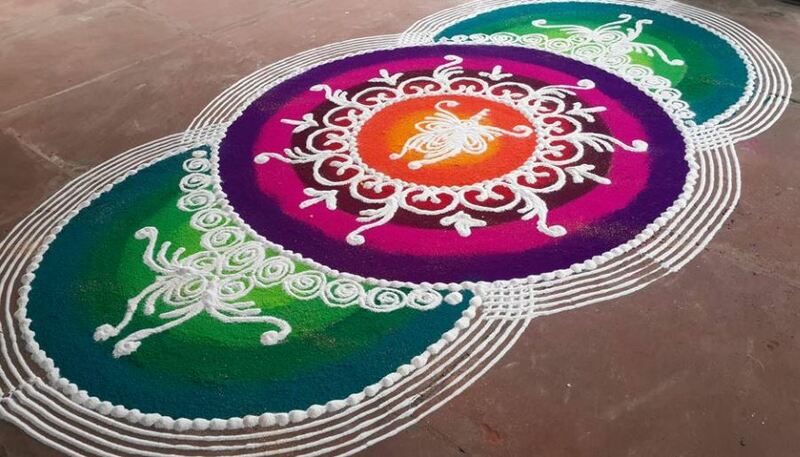 Go for this quick simple rangoli pattern for beginners. Just make what you wish and fill it with rangoli powder. Create a gorgeous combination of flower petals and rangoli powder. 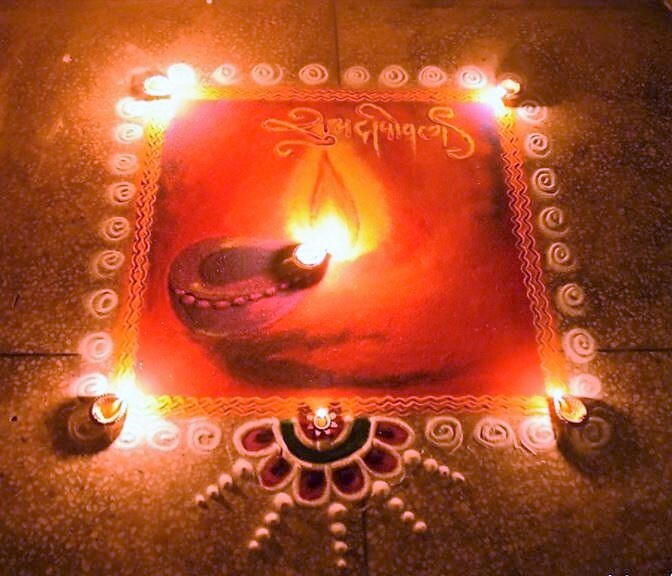 Light and place an oil lamp or a diya in the center of your rangoli design for Diwali in the evening. You can make lord Ganpati rangoli design in your living room. 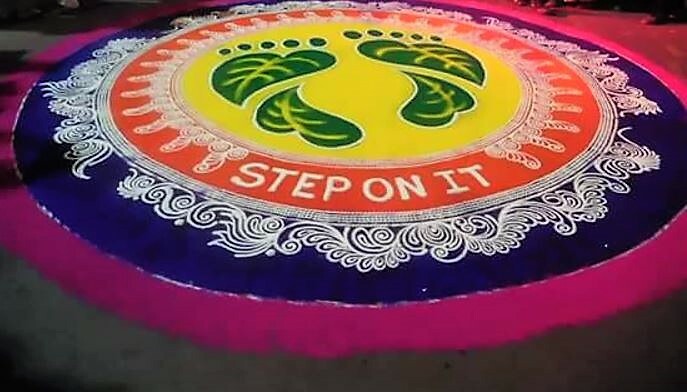 This rangoli is also apt for rangoli competitions that are held during Diwali festival in schools, colleges and offices. 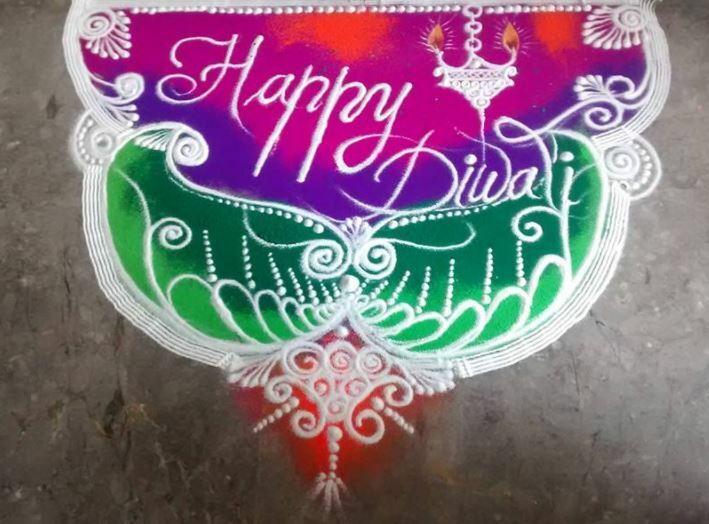 This entry was posted in Rangoli Designs and tagged Diwali Rangoli Design, Diwali Rangoli Designs, Diwali Rangoli Designs Freehand, Diwali Rangoli Designs with Flowers, Easy Rangoli Designs for Diwali, Indian Rangoli, Rangoli, Rangoli Art Designs, Rangoli Design, Rangoli Design for Diwali, Rangoli Design Images for Diwali, Rangoli Design Images New, Rangoli Designs, Rangoli Designs for Competition, Rangoli Designs for Diwali, Rangoli for Diwali, Rangoli Images for Competition, Simple Rangoli Designs, Simple Rangoli Images by Homemakeover. Bookmark the permalink.